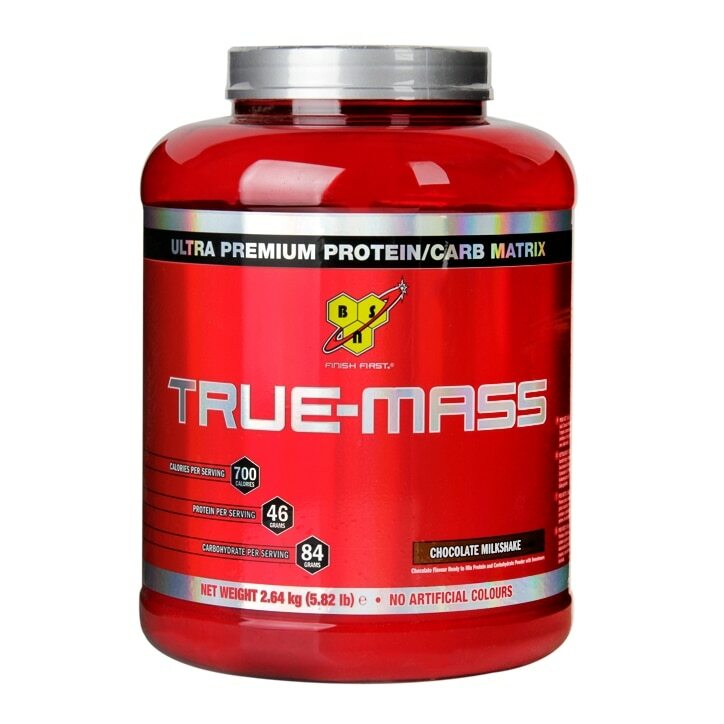 BSN True Mass Chocolate Milkshake Ultra-Premium Lean Mass Gainer is a mass-gainer shake for anyone who trains hard and isn't seeing the results they want. Fast metabolism? Lanky frame? Can't seem to put on weight? You need a quality mass gainer from protein experts. This macronutrient-heavy lean mass gainer provides the support you need to maximise lean muscle mass gains, with a blend of complex carbohydrates, fats from Medium Chain Triglycerides (MCTs) and Essential Fatty Acids (EFAs), as well as Branched Chain Amino Acids (BCAAs). There are added glutamine peptides and glutamine alpha ketoglutarate. This is a multi-functional AM to PM protein blend that feeds your muscles. Mix 4 rounded scoops with 470 mLs of cold water or any beverage of your choice. Adjust as needed for taste. Soy Lecithin, Maltodextrin, Creamer (Sunflower Oil, Maltodextrin, Sodium Caseinate [Milk], Mono- & Di-Glycerides, Tocopherols, Tri-Calcium Phosphate), Polydextrose, Flavoring [Milk], MCT Powder (Medium Chain Triglycerides, Silicon Dioxide, Dextrin), Thickeners (Cellulose Gum, Xanthan Gum, Guar Gum, Acacia Gum), Colour (Beetroot Red), Sweeteners (Acesulfame Potassium, Sucralose). Contains Milk, Soy, Egg, Gluten ingredients. Manufactured on equipment which processes products containing Nuts, Sulphites.